Of course Hugh Masekela was the likely source. His presence, along with that of Miriam Makeba, conferred a special mantle of authenticity on the Graceland tour, and Fuster had earned his musical reputation as the South African trumpeter’s percussionist. Their association dates back to a 1974 recording session in Lagos when Fuster was still with his own band, Baranta, successor to Sierra Leone’s seminal pop group the Heartbeats. Fuster grew up in a central area of Freetown known as Kroo Town. Traditionally Kroo people are seafarers, so Kroo Town was a natural meeting point for African and western culture. “When anything comes into an African city,” he says, “it usually comes through the bays. So even the music came through the bays at that time.” His seafaring father would bring home records by Louis Jordan, Nat King Cole, and Ella Fitzgerald while the streets shook to the beat of traditional dancers and drummers. Soon after it had begun, his apprenticeship was cut short by Biosei’s untimely death. But the setback was only temporary, for one day Fuster’s mother took him to Freetown’s Church of the Lord Aladura. The sound of celebratory drum beats cascaded into the street as he approached the building, and he was hooked. For the next four years he played drums in the church’s daily services. “Most of my drumming, what happens now, today, actually took form in that church,” he declares. The Heartbeats had formed in 1961 with singer Geraldo Pino, guitarist Balogun “Dynamite” Johnson-Williams, and drummer Reuben Williams. Bassist George Keister and Hassan Deen, whose speciality was Congolese style vocals, were soon added to the mix, and in despair over their drummer’s erratic behavior, the players eventually replaced him with Fuster. 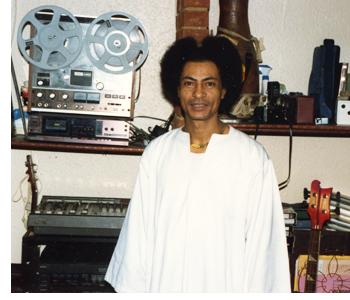 The 1960s was a golden decade for Sierra Leone’s music scene. Pop bands proliferated. Recording studios and record dealers sprang up around Freetown. Geraldo Pino and his Heartbeats was one of the dominant bands, recording songs like “Maria Lef for Waka” and “Oh Ye Charanga,” staging dances at Goodings Hall, and playing nightclubs like the Tiwana, Flamingo, and Palm Beach Club. By the mid-sixties the band was touring regularly, playing tight covers of American soul songs. Propelled by Fuster’s devastating drums and Pino’s James Brown dips and struts, they fomented West Africa’s soul craze. Despite occasional personnel changes—Dynamite, for example, left to form his own band—the group prospered. As the soul craze wore off the players weaned themselves from covering western pop songs by developing new, original material. But by 1972 tension within the band was high. Money and management had become constant sources of friction. After playing some Christmas dates in Ghana, Fuster quit and went to Lagos. Most of the others soon followed leaving Pino odd man out. The Fuster faction resumed playing under the name Baranta, a Krio word that means rebel. In 1974 Fuster met Hugh Masekela through his friend Liberian singer Miatta Fahnbulleh—a meeting that led to an album project with Masekela, Fahnbulleh, and Baranta recording together in Lagos. Incredibly, the music was lost when the master tape was inadvertently left on a train in Nigeria. Baranta broke up in 1976 when Fuster became stranded in New York where he had gone in search of better equipment and performance techniques. He finally scraped together enough money to get back to Freetown in 1978. There he taught karate—he had achieved a black belt while in New York—and booked entertainment for the newly opened Bintumani Hotel. He also staged shows at the City Hall Auditorium, which featured various performers and his own satirical monologues.